As the final chord of the ‘Hallelujah’ reaches its last dying twitches, the Concert Manager leaps to his feet to announce “Ladies and Gentlemen, refreshments will now be served at the back…” the remaining sopranos do not need a starting gun. They sprint away with a start that Usain Bolt would envy – nothing and nobody is going to get in the way of their desire for a cuppa. Alas, they had been standing on one end of a section of staging, the middle of which was resting on a fulcrum, rather like a see-saw. The effect of six sopranos rapidly exiting one end en masse, only serves to catapult the tenors on the other end into the air. For those who survive the elbow-assisted dash to the West end, the prize is a boiling hot cup of brown liquid, vaguely resembling tea, served in a flimsy plastic cup. Universal finger- burner (wherever you try to hold it, the result will always be the same)! And then there’s the Rich Tea – a biscuit of utter disappointment, well-known worldwide as delivering little to entice the taste-buds. But right now, for an organist who has been at the rehearsal since 1.55pm – it is a prize worth fighting for. One of the 4 Spice Basses (Posh Bass), clearly thinks so as he swipes a mighty handful, leaving a forlorn pile of crumbs for me to pick through. It is then that I spy HER, (Verity Trilling’s singing teacher) , who has a look that could even freeze my tea – and she is heading in my direction, armed with her cup of scalding tea-style drink, a biscuit in her mouth, ‘Prout’ under her arm and waving a metronome in the air, hoping to attract my attention. By now I haven’t the mental stamina to have an argument, listen to a complaint or even string two intelligible thoughts together, so I do the brave thing – look at the floor and run away. The Concert manager decides enough is enough and screams that it is now time for the raffle. Conversations continue unabated as he calls out several colours and numbers and no-one takes any notice…. It continues like this as the choir push and shove their way back into their seats, and I tiptoe over my plank and launch over the choir stalls ready for the final part. The conductor returns to his podium (an upturned beer-crate), picks up his baton, has a final check of his raffle tickets and dramatically gets the chorus to stand. He then meekly sits them down again as the Soprano’s singing teacher gives him a withering look, and we start “I know that my redeemer liveth”. (I am sure I can hear the faint ticking of a metronome in the distance?). Part the third is a welcome sight, we are nearing home. There are some hairy moments – the chorus are caught out by the sudden change of pace and dynamics in “Since by man” – it even wakes up one of the Spice Basses (Sporty Bass) behind me, who was enjoying a quiet nap. ..so we all use our imagination. A couple of cuts later and we arrive at Verity’s final display. This time I definitely hear clicking, and try to decide if it’s the urn cooling down or a demand from Verity’s teacher. Against my better judgement I assume the latter and proceed with her Aria at that tempo. It quickly becomes apparent that poor Verity is not going to survive those long notes and runs without either a major accelerando or by giving her an oxygen mask. 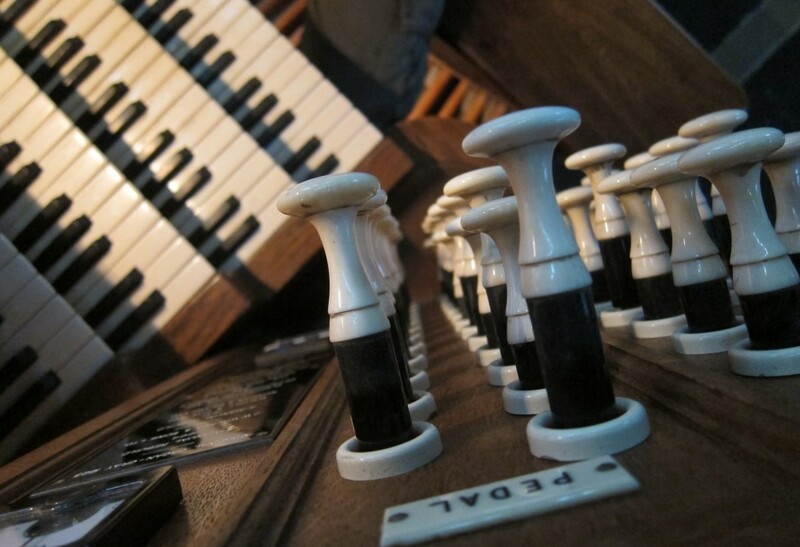 I choose the former and inwardly resolve to hide in the organ until long after the concert has finished. The Aria seems to be a new arrangement, previously unknown to me, as it contains an obligato part for percussion – namely the folding up and putting away of trestle tables, and the squeaking of the urn trolley. Personally, I prefer the version without the added percussion, but if that’s what the public wants..
Tears of joy and exhilaration fill my eyes with the words and music of the final “Worthy is the Lamb”. The “Amen” fugue never ceases to amaze me with the depth and complexity of its superb polyphonic writing. Imagine JUST writing that in your lifetime, never mind all the rest of this great work and you’d die a happy man! One of the Spice Basses ( Baby Bass), obviously shares my enthusiasm for it, as he leans over to his mate and whispers loudly “I like this one… it’s got good words”. The applause at the end are generous and sympathetic and the soloists are given gifts. Marjorie was recently elected Soloists Gift Co-ordinator by the rest of the choir, but she has forgotten to co-ordinate the gifts for the soloists – the flowers and bottles of wine. So instead, Verity is given some talcum powder, the CONTRALTO, a chocolate orange, the heart-throb tenor is handed a calendar with assorted pictures of cute kittens, and Ted Drags (Bass) is delighted by the gift of a colouring book with attached crayon set. Each gift is tastefully adorned with a blue or pink raffle ticket. Our organist’s favorite “warm-up” piece is a compilation of The Hallelujah Chorus and the song “Yes, we have no Bananas”. You can just imagine how the words “no ba na nas” replace “Hal le lu jah”. Am loving your very entertaining blog ,,really appreciate your comments on your experiences . I am not an organist, but have been in church choirs and am a minister – was moved to tears by your description of performing Messiah – but I lost it completely at the point where the ‘percussion section’ took over. How many sermons, committals at funerals and other significant moments have been accompanied by the same cacophony from the back of the church? I am not a tea drinker OR biscuit eater and thus feel I cannot address this difficulty without seeming to be unfeeling and churlish but I do wish the tea-ladies would cease and desist. Beautiful tale. It makes me thankful that I sing with good choirs! Enjoyable reading ,but surely not …..unclaimed raffle prizes ! Amusing, but rather unkind, I think. But, hey, that’s just me…. I have so enjoyed this series! Having to play a “surprise” instrument several times with community choruses in the past 35 or so years, you hit my tickle-bone right on the spot! Thanks! Likewise! It is amazing though what can be achieved on an “unsuitable” organ.